Eight years ago, I revealed that the best reason for me to blog is all of you. The post seven years ago reiterated that point with my gratitude for all the friends I’ve made via blogging and social media. Six years ago, I confessed my love of the blogging format because of the connections possible. Five years ago, I revealed that blogging for you pushes me—in a good way. Four years ago, I expressed my gratitude for the connections we make despite meeting only online. Three years ago, I noted how much sharing those connections added meaning to my life. Two years ago, I talked about how our connections with online friends can help fill in the holes left when real-life family or friends don’t understand us or stand divided from us. And last year, I shared my gratitude for how much all of you—even if all you’re doing is reading my posts—encourage me. A year ago, I finally mostly overcame one of the health problems that have been plaguing me over the past few years. A year’s worth of physical therapy and new treatment made it so I could walk again after problems with the nerves and tendons in my feet. At the same time, my surgeon called a time-out on the surgeries and medication for my bone infection to let my body recover while we try to figure out the next step. So for this past year, I wasn’t “actively” struggling with as many health issues, and I hoped that meant I could get back to the level of accomplishment I felt before. Of course it hasn’t been that simple. I’ve been stalked by burnout and similar problems, and we also grieved the unexpected death of our cat. So I still don’t feel like I’m running on all cylinders when it comes to writing. I could be beating myself up about that fact (and truthfully, I sometimes do), but in general, I’ve gotten much better about reining in my perfectionism and expectations of myself. That improvement is because of your reading and appreciation of my work here even when I worried I’d fallen short. It’s because even though I feel like I could do “better”—do or accomplish “more”—you all make me feel like my best is enough. That’s a huge gift to a perfectionist like me. *smile* Thank you. I hope my posts here, whether craft, business, or life-related have similarly helped you recognize that your best is enough. 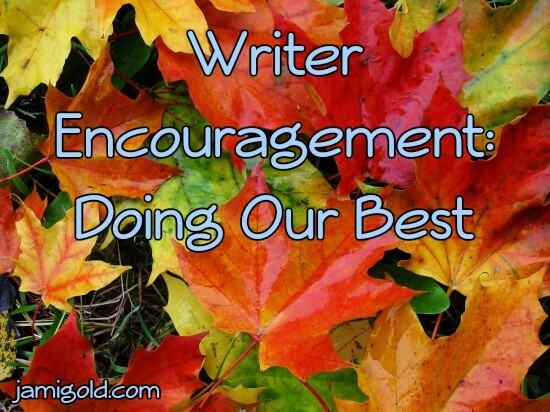 Sure, we can always improve, and our best might not win awards or make us a bestseller, but that’s the case for most authors. Growth and milestones will still be there tomorrow, next month, and next year. Improvement isn’t a destination, and tying a sense of accomplishment to measures outside of our control isn’t fair to us. So rather than thinking about where and how we fall short (like my NaNoWriMo word count), we can feel a sense of accomplishment for when we’ve done our best. Everyone of you that I’ve connected with over the past years has helped me find some semblance of pride when offering my best—even if it’s not perfect. As I said, I hope my posts and social media help encourage all of you as well. Back when I did the call for guest posters before NaNo, several writers questioned whether they were qualified to guest post. Yes. Your expertise is enough. Your knowledge is enough. You are enough. Pascale Kavanagh helped us get in a good writing frame of mind with her tips on meditation. Gwen Hernandez gave us pointers for using Scrivener, both with NaNoWriMo and with compiling our work later on. Pamela Donison shared tips on using haiku to strengthen our prose. Selina J. Eckert helped us learn how to fact check our fiction. Maureen Crisp shared her insights from being a book award judge to help us level-up our writing. Deborah Makarios giving us the inside scoop on how Creative Commons copyrights work—and how we can make them work for us. Even though my NaNo progress is pathetic, I’m still getting more words done on my story than I would have without their help. And even better, we all learned something beyond our experience because they chose to share what they know. Win-win! Do you struggle with feeling like your best is enough? What helps you feel like what you’ve done or who you are is “enough”? Does encouragement—even from those you don’t know in real life—help you during difficult times? What connections are you most grateful for? Is there anything special you’re grateful for this year? Thank YOU Jami for your blog posts. Consistently informative and useful. Thanks, you do great work. I am learning constantly and I’m glad that my family is all keeping well. Jami, like you, I expect a lot from myself and feel the exasperation when I don’t do it exactly the way I believe it should be done. What helps me feel that I’m doing okay despite the struggles and mistakes is slowing down and reaching out to whoever I feel will contribute what I need: moral support, advice, or even agreement in what I am doing [which doesn’t happen often]. Because of my physical limitations, my friends via the internet have become my closest friends. All are just an email away. This is the second post I’ve seen this week about “enoughness.” I think the universe is trying to tell me something. 😉 Thank you for helping build the online writing community where so many of us find inspiration and comfort and fellowship.